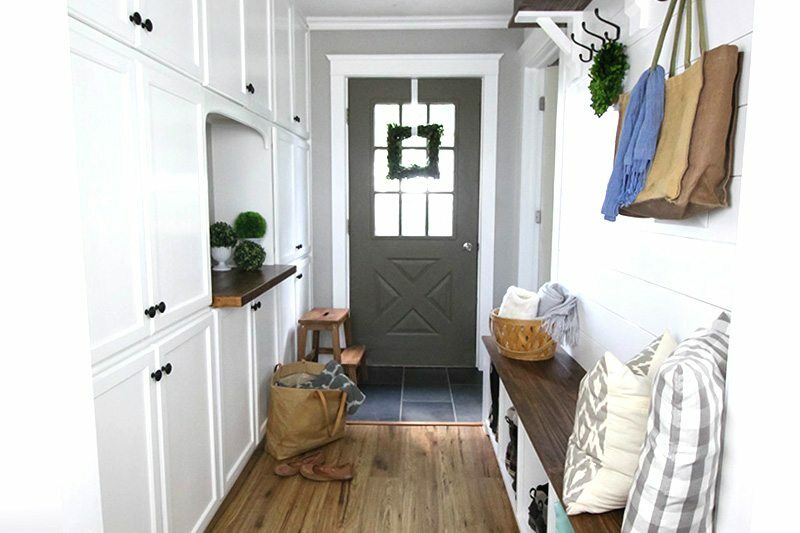 I have a thing for mud rooms. It’s true. Something about all of those cubbies, hooks, cupboards, and bins, all lined up and ready to bring order to your life is just endlessly exciting for me. We have a few little mudroom spaces in our house, but only one that I would consider really “finished”. Most of the mudroom areas next to our entryways were just kind of thrown together out of necessity, to keep the stuff and the junk off the floor, mostly. The good thing is though, that it’s kind of allowed me to look at how all these different types of setups work for us, or how they don’t work for us in some cases. I was actually surprised when I took a moment to think about how these spaces were working because I realized that some of the solutions that I thought were absolutely brilliant didn’t end up being all that helpful in real life. 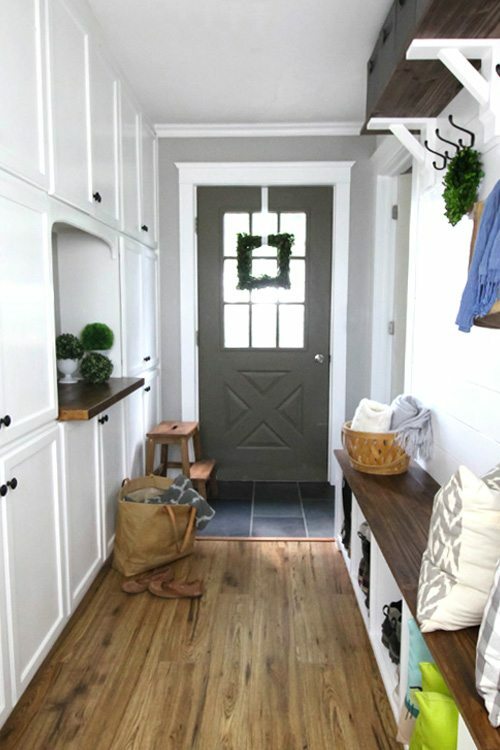 I thought I’d break it down for you a little bit today in case you find yourself trying to plan the perfect mudroom renovation any time soon. 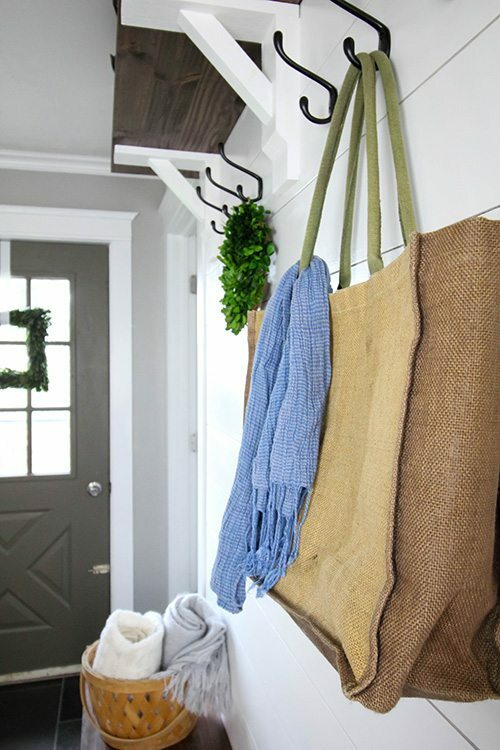 Hooks seem to be pretty much the first thing that comes to mind when we think of a mud room or entryway. Hooks are awesome! They’re simple, inexpensive, and they look really nice and tidy all in a row even if they’re empty. A row of hooks is definitely a good idea. So several rows of hooks must be even better, right? Turns out, not so much. We have an area where we have three long rows of hooks one on top of the other, and also an area with two rows of hooks. I thought this was the smartest move ever, but it turns out that the stuff that gets put on the upper hooks is usually the stuff that doesn’t get used quite as often and would do just as well stored away in a bin or basket. I might say that the one exception would be with warm hats in the winter, but then, we usually end up having many, many (many, many, many) more hats on the hooks than we need. We only have so many heads in this family, after all. 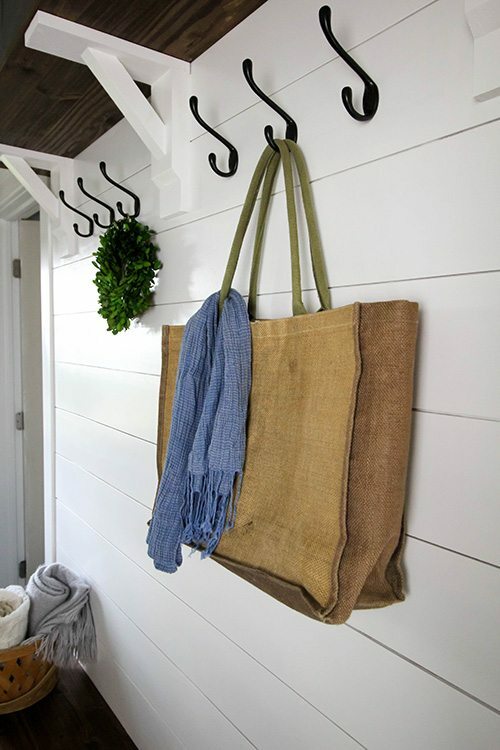 One row of hooks seems to be perfect because it allows you to quickly hang up a coat, bag, or hat without encouraging you to hang up everything you own in your mudroom for all to see. Related: The Easy Way to Hang Hooks in a Perfectly Straight Row. We have storage benches and some plain wooden benches here and there and I have to say that they’re mostly just OK. It’s nice to be able to have somewhere to sit, and it’s also nice to be able to put the excess shoes into the storage benches and hide them away, but I find that, again, they just mostly encourage clutter and over-storage of things we should probably put away properly or just get rid of. Our benches seemed like the best idea ever, but it turns out that they’re not so helpful when you put them to use in the real world. 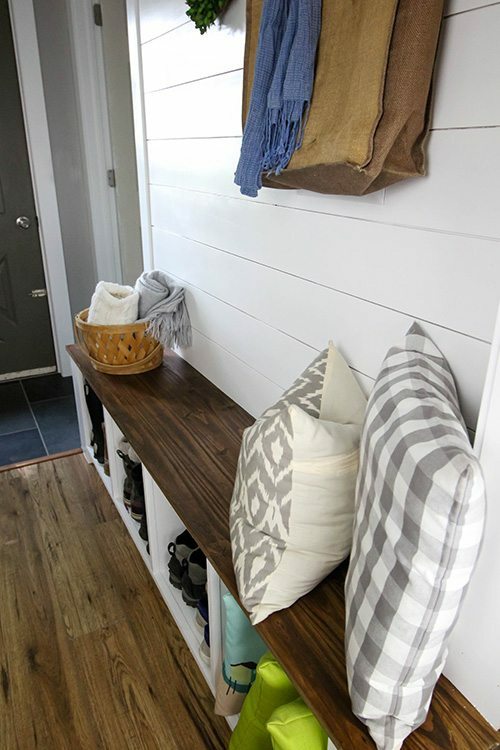 I’m calling this next type of mud room feature “horizontal surfaces”, although I’m sure a lot of people will think of these as benches as well, only bigger. The difference with what I call a horizontal surface is that it’s much bigger and more useful on a daily basis as both a place to sit and a drop zone that doesn’t get completely covered in junk in 5 seconds flat. I would classify the lower area that we have in our new back hall mud room as a horizontal surface and it’s definitely super useful. Unlike a little bench that just sits on the floor, this horizontal surface is built in and runs the entire length of the space available. Kind of like a mini kitchen counter that you can sit on. We use this surface constantly as a drop zone for bags of stuff from the beach that needs to be put away, as a set-up area for yard sales, and vacation packing, and just about everything else. The great thing is that because it’s so long, it holds a lot of stuff and it can be used as a drop zone for most daily items without becoming completely filled up. We have a little horizontal surface on the opposite wall in the form of a little nook in the wall of cabinets and it’s almost useless compared to the one on our mud room wall. 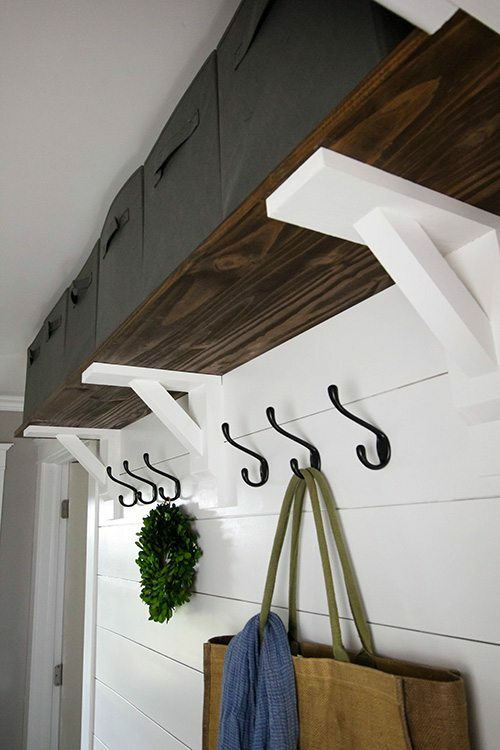 If you can fit in a long horizontal surface in your mudroom, it will definitely be the part of the room that you use the most! I sort of thought that our cubbies might possibly become cluttered up, but they’ve actually been surprisingly useful! We did build them with the specific intention of putting our boots in there, so I’m sure that helps, but I have ended up putting more in there than I originally intended to and they always seem to stay neat-looking and keep the room feeling tidy. Again, I think this may be helped by the large horizontal surface because random things get temporarily put down there instead of stashed in a cubby to be forgotten about. I’ve also been using one of the cubbies to store some of our outdoor cushions when we’re not using them and again, totally tidy-looking. So cubbies get my stamp of approval as long as they’re effectively combined with other complimentary storage solutions. We have this row of bins on a shelf above our hooks and I only have kind of a half-opinion on these so far because we’ve only been through the summer months. We added these to store all of our winter hats, gloves, scarves etc so I wouldn’t have to have them in a bin in the basement. I did switch this area up a little bit because we had originally placed 4 wicker baskets up here. I realized shortly after that, that I could fit 6 of these fabric bins up there and therefore a lot more stuff, so that’s exciting. So far, I only have our winter stuff up there so about half of the bins are empty. I think we’ll probably end up putting some of our summer hats, goggles, extra sunglasses and stuff like that up there at the end of the season, but I haven’t yet fully-realized the potential of this space. I do think it’s really nice to have our winter stuff up here where it’s clean instead of in the crumbly old basement, but also still totally hidden and out of the way. 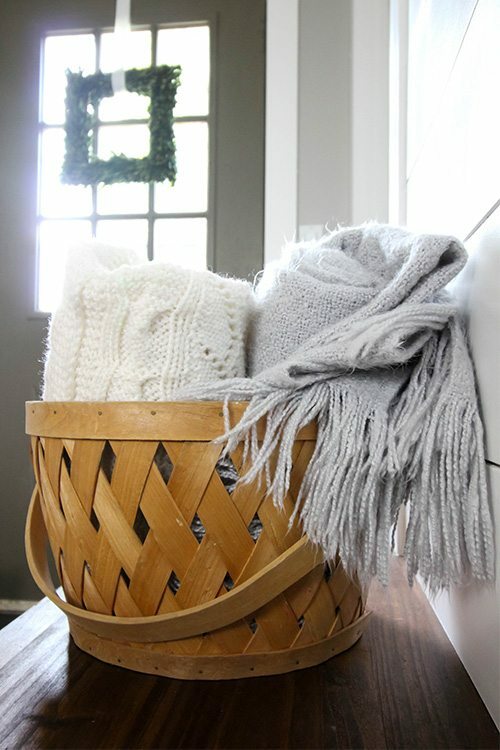 I also think these baskets are a great solution instead of adding in more hooks because the stuff in there is completely out of sight, but just as accessible as it would be if we just had another row of hooks up there. I think the only downside to this type of storage is that you could end up hiding stuff up there and then forgetting where you put it. These shelves are kind of out of reach for a short person like me, so they aren’t something that I find myself looking into everyday. If you can keep them organized though, I think it’s amazing to have the extra storage in what would have been completely wasted space! The thing with closed storage is that it really does take discipline to maintain its effectiveness. It’s so easy to find yourself just stashing random stuff in there “just this once” over and over again. I definitely need to use my Cleaning Ninja tactics on a regular basis to make sure that I’m maintaining order in these cupboards. I wouldn’t say not to add them, because they are really amazing to have, but I definitely think it’s good to go into it knowing that you’ll need to keep on top of things so this dream storage situation doesn’t become a nightmare. If DIYing an entire mud room isn’t in the cards for you, I love this set-up because it has pretty much everything I mentioned and it fits into such a small space. 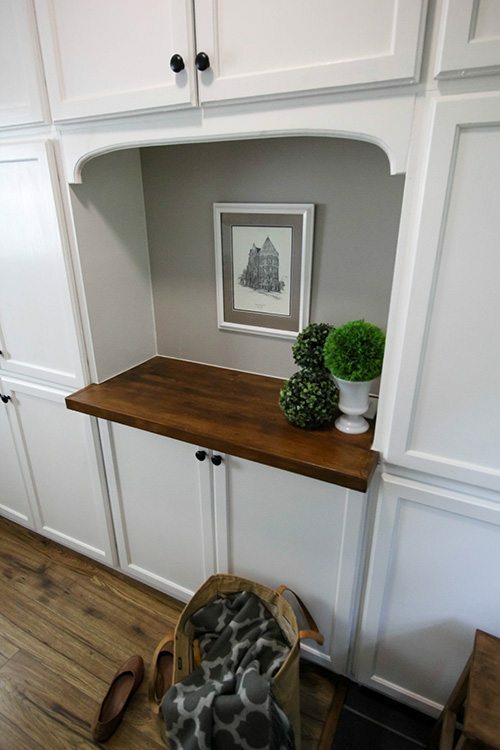 This mud room hall tree is beautiful, and you could use the shelf up top as your “overhead” storage really easily by adding in a few extra bins. 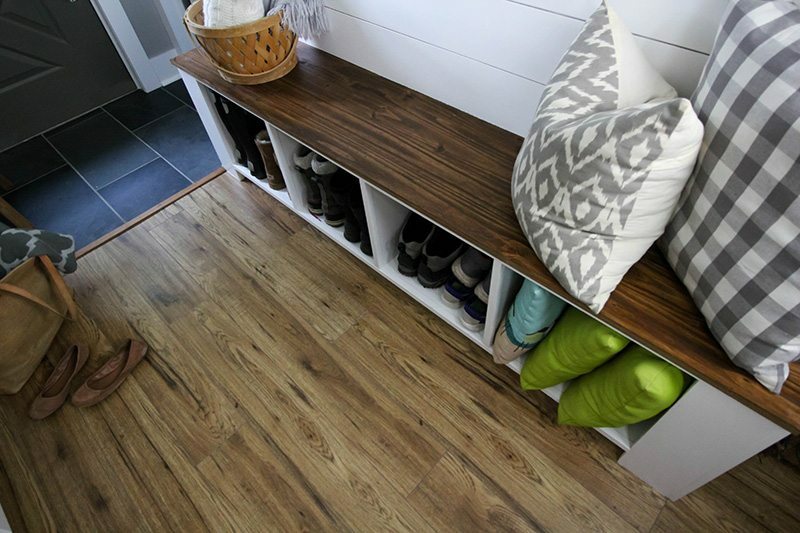 Does your mudroom have any other storage features that I’ve missed? Which ones have been hits and which ones have been misses for you? 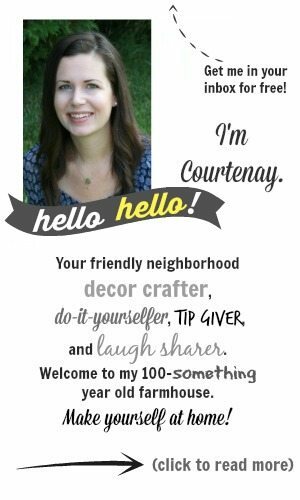 These ideas are so creative! I feel like I have to incorporate each and every one of them, lol! Otherwise, great post with great tips! Thanks! Hi Karen! I know exactly the bins you’re talking about. I had some that I used to buy and they were discontinued. I started using these because they’re sturdy and I like the colours that they’re available in, but the lack of labels can be a problem sometimes. For these ones in this room, I just consider it my memory challenge for the day to see if I can remember what I keep in each bin!